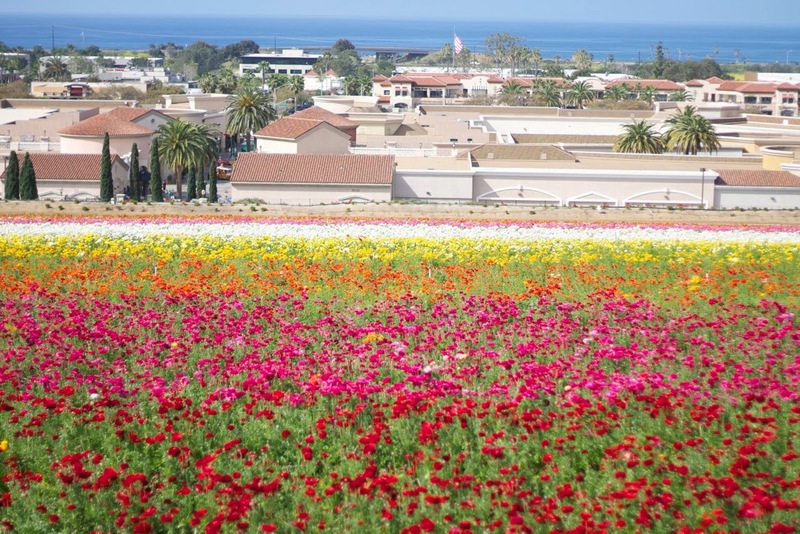 Today I wanted to start off by highlighting two really cool spots: Carlsbad Flower Fields and its fashionable neighbor The Carlsbad Premium Outlets. During a very informative tractor ride and tour of The Flower Fields, I came to learn that it's not just about flowers. Yes, there are about 70 million flowers sprawled out in a breathtaking rainbow combination, but the sentiment of the field is that of history and family. 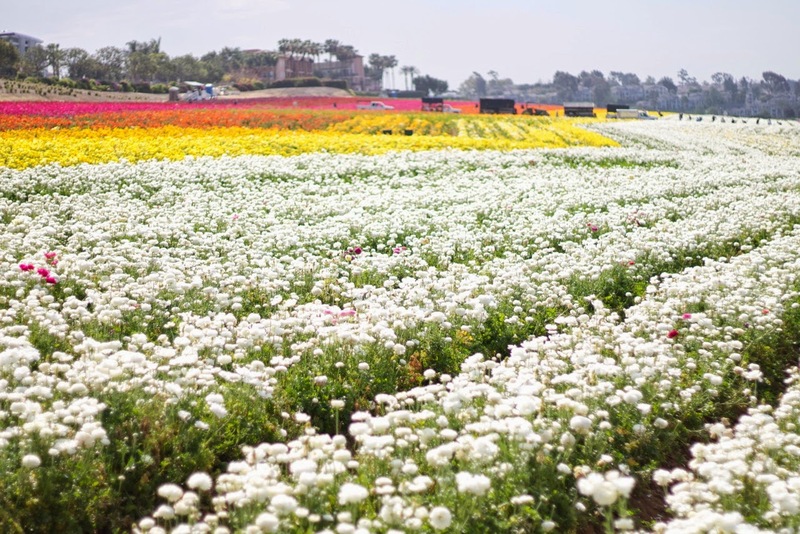 History in the sense that The Flower Fields has been a San Diego staple for over sixty years! They also have established so many family friendly activities, a whimsical Santa's playground for kids and even an event calendar for all ages (here). An interesting tidbit is that if you approach the fields and see that some of the land is still not in bloom, it is a strategic move by the growers to lengthen the season. The whole field is not fully in bloom at one time, they are bloomed in phases so that the season lasts longer. This year the season ends May 10th so make sure to pay these beautiful fields a visit or else you will have to wait til next year! Now, for all of you shoppers this section is for YOU! As seen in the pic above the fields are next to a The Carlsbad Premium Outlets where you can find top name brands and great deals. I have been here before specifically for the Kate Spade Outlet since it's the only one in San Diego. During this visit I went again and came out with great deals like the hot pink crossbody I recently wore in this post. Shopping can be exhausting (hee hee) so we ate lunch at the delicious Rubi's Diner, which you may have seen around town if you're a San Diegan. It has that old school diner feel with great food and again history. I learned that there's an actual Ruby (see pic below)!! She is the mother of the founder of Ruby's and she's currently in her 90's! If you pay them a visit (which I highly recommend) make sure to hashtag your pics #TheFlowerFields and/or #FoundatSimon #CarlsbadPremiumOutlets! 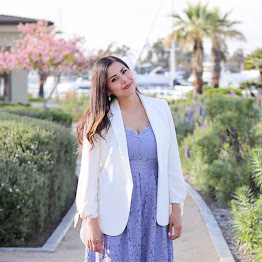 It was such a fun day learning about The Flower Fields and The Carlsbad Premium Outlets thanks to all of their representatives who hosted us bloggers for Media Day.